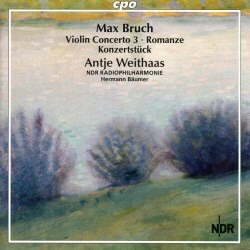 Played by German violinist Antje Weithaas, this is the third and final volume in the CPO cycle of Bruch’s complete works for violin and orchestra. Bruch’s Violin Concerto No. 1 in G minor continues to take centre stage. It headed the Classic FM “Hall of Fame” top three hundred chart for several years, and is still enduringly admired on record and as a regular feature in the concert hall. The only other concertante work by Bruch to come anywhere close in esteem is Kol Nidrei for cello and orchestra. Still admired is the Scottish Fantasy for violin and orchestra, which remains well represented in the catalogue. Bruch’s magnificent pieces for violin and orchestra have been recorded several times. Most notable is the set by Italian virtuoso Salvatore Accardo with the Gewandhausorchester Leipzig under Kurt Masur. Recorded in the late 1970s at the Gewandhaus on Philips, Accardo has virtually had the field to himself with his stylish and warmly characterful playing. Now, with these recent recordings on CPO, Accardo has stiff competition from soloist Antje Weithaas and the NDR Radiophilharmonie. The earliest work on the release is the Romanze from 1874, a piece that for some evokes the music of Robert Schumann, especially the Fantasy in C major. Bruch had completed the first movement in A minor of a projected second violin concerto. In the event he decided to leave it as a separate single work marked Andante sostenuto, known as the A minor Romanze. As was his custom, Bruch took advice from the renowned soloist Joseph Joachim on the violin writing, with some polishing from Robert Heckmann to whom the work was dedicated. Bold and assertive, the playing by the assured Weithaas has a compelling intensity. Clearly knowing this virtuoso showpiece inside out, Weithaas ensures no nuance is missed or detail left untouched. Composed in 1891, almost twenty five years after the famous G minor concerto, the Violin Concerto No. 3 in D minor is dedicated to Joachim. It was Joachim who persuaded Bruch to expand into a full violin concerto the Concert Allegro in D minor he had recently written. Joachim also premièred the D minor Third Concerto at festival concert in Düsseldorf. It was described as a triumph by the delighted Bruch. Displaying extremes of expression, it feels as if Weithaas is exploring deeply the core of the score. Striking in the Allegro energico is the undertow of yearning with which she infuses her playing, together with the aching tenderness of the Adagio. In the Finale: Allegro molto, the degree of buoyancy Weithaas provides has an infectious charm. Bruch finished his Konzertstück (Concert Piece) in 1910, a work he dedicated to soloist Willy Hess. As concertmaster of the Boston Symphony Orchestra, Hess had performed the A minor Serenade to acclaim before moving to Berlin. The Konzertstück is cast in two connected movements. It seems that Bruch originally planned it as his fourth violin concerto. The work was premièred the following year by American violinist Maud Powell at the Norfolk Festival in Connecticut, USA. Played with clarity and virtuosic assurance, the opening movement Allegro appassionato is laden with dramatic incident. The second movement, an engaging Adagio ma non troppo lento, substantially uses the theme from the Irish folk song “The Little Red Lark” and strikes a tone of affecting yearning. Throughout this release, Weithaas has the advantage of first-class support from conductor and orchestra. Hermann Bäumer paces marvellously well and receives stylishly expressive playing in return. The recording was made at Großer Sendesaal des NDR in Hannover. The engineering team has provided fairly close sound, warm with good clarity and satisfying balance. CPO lives up to its usual high standard of presentation with an extremely helpful and interesting essay. Antje Weithaas displays her remarkable prowess in these glorious Bruch works with stunning performances that can stand firmly alongside the finest in the catalogue.